Sure to be a favourite in your wardrobe for years to come, our Ranga 31 brushed cotton fabric showcases a big and bold navy, blue and white check on a beautifully soft base. Ideal for the cooler months, this modern classic will last the years. 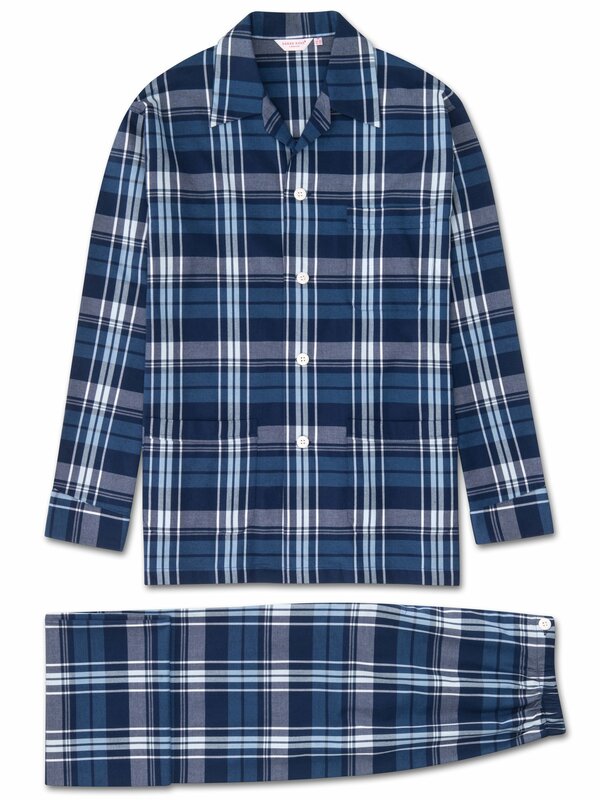 Trust us, you'll want to stay wrapped up in these pyjamas all weekend. Crafted from a medium-weight brushed cotton, the Ranga 31 utilises a unique brushing technique to comb and soften the fibres for an extraordinarily soft handle making this PJ set a dream to sleep or lounge in. Featuring a three pocket jacket, classic collar and adjustable two button traditional fly, this classic fit pyjama has a relaxed cut and elasticated sides on the trousers, meaning the front and back are flat for your comfort.